The highland games are a ancient sport from Scotland. They were originaly designed as a way for the Scotish people to train there combat skills. The events are, the caber toss, hammer throws (16 and 22lbs), weight throw for distance (28 and 56lbs), 56lbs weight for height, and the sheaf toss. They sometimes also include the farmer's walk and the atlas stones but those are not traditional events. Bruce Aitken is the current record holder in the 16lbs hammer throw at over 156 feet. The Scottish hammer is not thrown like the olympic hammer. The Scottish hammer is thrown by spinning the hammer around your head, not spinning your body. Many top athletes use steel spikes on the front of there shoes to dig into the ground. 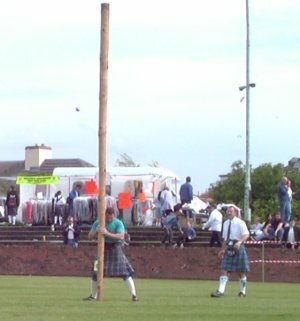 The Caber Toss - The caber is not thrown for distance but for accuracy based on a imaginary clock on the ground. The athlete must turn the caber. A perfect toss is a 12:00 o'clock, that would be the caber turning over and landing in line with the athlete and the judge in behind the athlete. 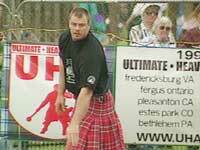 Matt Sanford is the current and multiple time world champion in highland games. He has set world records in most events at one time or another. He still holds the current record in the 28lbs weight for distance at over 94 feet. He is also one of the few men to throw the 56lbs weight for height over 18 feet, not useing the spin technique. Several thing are required to compete in highland games. Good strength, and explosive power, along with goos training with the implements are all very important to a highland games athlete. A lastly a athlete requires a kilt, the most important thing.